Faith + works. It takes both to successfully live out the Christian life. James knew it and he continues to share this truth with us in James 2:20-23. James now gives examples of people who lived out their faith through their works. Abraham, the father of the Jewish people, had amazing faith in God. He also had amazing actions that demonstrated that faith. Without faith, Abraham wouldn’t have taken the actions he took. Yet, if he would have just said he had faith in God and didn’t take those actions, no one would have believed him. Can other people see our faith? It should be evident in all that we do and say, just like it was with Abraham. If it’s not, what’s lacking, the faith or the works? We can trust God and have faith that He will do what He has said. As a result, our every action should line up with that faith so that our works are there to demonstrate and perfect our faith. 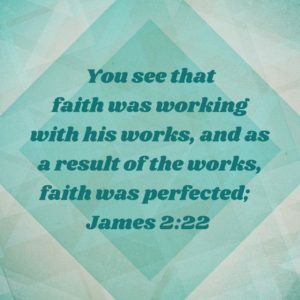 Is your faith evident to others? What steps do you need to take to perfect your faith in Christ?